The U.S. is growing more food then we know what to do with, while many people in our community are hungry and don't have access to fresh produce. Using volunteers to harvest, preserve, and distribute, Hands 2 Harvest redirects unsold produce to those who need it most. Over $6 billon in food never leaves the farm in the United States. We partner with local farms to harvest, preserve and distribute that food through R&G Family Grocers, Cooking For Health, and provide to partner agencies. We currently take volunteers to our partner farms including Shanks Farms and Southwood Farm to harvest extra produce grown that doesn't have a home. Volunteers get to take some home and we make field tacos right there to taste the freshness of the harvest. The rest goes to R&G Family Grocers, Food on the Move, Food Bank of Eastern Oklahoma, and back to the kitchen for preservation. 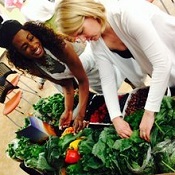 Stay tuned for a summer harvest schedule for volunteer opportunities. $197 billion in food goes unsold and is thrown away in retail stores annually. Hands 2 Harvest partners with local retail stores to pick up green waste which is then used to feed livestock. We currently take produce waste from Whole Foods each day. We are looking for other grocery store partners to do the same. This rescued food is great to feed livestock and for composting. It currently goes to Hamalot, a pot belly pig rescue and to R&G Family Farm. One restaurant can generate 150,000 pounds of food garbage each year. We partner with local food service operators to gather this waste and use to create compost for R&G Family Farm and community gardens. We have recently partnered with Tulsa University to take their kitchen waste. This waste will be used to make compost that will be donated to community and school gardens.